RED SPRINGS, The Athens and the Saratoga of Robeson County. The citizens of Red Springs are proud of their town, as, indeed, they may well be. Not only so, but the whole county is proud of Red Springs and its great college. Red Springs is an ideal residence town. The shady verandahs, the fine lawns, and the imposing residences are the pride of the inhabitants. The architecture, it is noticed, is adapted to the climate, as is that of all the towns of the county. Latitude accounts for any peculiarities that may appear to those familiar only with homes in more northern sections. Red Springs is situated on the Bennettsville branch of the Atlantic Coast Line. It is twenty miles from Lumberton, and the one great plaint of the town and section is the difficulty of reaching the county seat, since there is no railroad connecting the two points, and the schedules of the connecting lines are often far from what is desired. But, with the exception of official business which must be transacted in Lumberton, the college town is strikingly independent of the county-seat. THE MAKING OF RED SPRINGS. The first element, possibly, in bringing Red Springs to the foreground is the springs that give name to the place. The waters possess merit, and a large hotel was early erected. 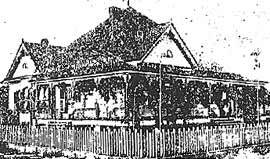 The place was then chosen for the Baptist Sunday School Chatauqua, and great crowds gathered there for several days each year. The ministers' and deacons' meetings of the Presbyterians also acquainted many with the ideal situation of the town and the merits of its waters. Accordingly, when the Fayetteville Presbytery decided to establish a girls' school, Red Springs was chosen as the place. But it was not conceived by the founders of the school that it would ever reach its present magnificent proportions. Seminary it was at first, and it appeared doubtful whether it would deserve that name, but Providence gave them a paragon of energy for a principal, and in the face of apparently insurmountable obstacles, the school has steadily advanced. The earlier wooden buildings have been discarded, as has the name seminary, and instead of one or two of the former stand several architectural beauties, imposing brick structures, wonderfully adapted for their several purposes. The former name, "Red Springs Seminary" has given place to the more imposing one of "Southern Presbyterian College and Conservatory of Music," and the new name is no misfit, as is apparent when it is known that half a thousand young ladies from several of the Southern States are here matriculated. It does not come within the scope of this article to review the steps by which this college has attained so magnificent a success, but we would seek earnestly to impress the reader with the magnitude of the work and its excellence, and call attention to the fact that it has been the development of only ten years. The North Carolina Military Academy it is styled, but it has failed to live up to its name. However, a new day has dawned, and this school has apparently a bright future. No man has done more for the college at Red Springs than Mr. Morgan, of Laurel Hill, and none so much. He has given thousands of dollars to that school, and now he has taken hold of the academy, and is building a handsome brick structure as a home for it, and every indication as to its future is big with promise. Red Springs is scarcely less proud of its higher schools than of the public school, which is considered one of the very best in the county. Mrs. McKinnon, the principal, has won many encomiums as a teacher. Presbyterians predominate at Red Springs, but there is both a Baptist and a Methodist church. The latter is the only church in the town that has a pastor at this time. He is Mr. S.E. Mercer, a native of this county, and a good preacher. The town does not expect to ever be a commercial centre. Its trade area is rather contracted; nevertheless, the mercantile business of Red Springs is considerable. A fire some months ago wrought considerable damage in the business section of the town, but, as usual with such calamities, will, doubtless, result in good, as already a dozen good brick stores are under construction, and it is only a matter of a few weeks when the town will be prettier than ever before. Cuts of two or three of the best stores in town are given. That of the Robeson Mercantile Company is one of the very best storerooms in the county. Moreover, it is stocked jam full of just such goods as meet the requirements of the trade. The presence of three or four hundred boarding young ladies make it necessary to carry such a stock as will meet their requirements. And the schools also make this an excellent point for the sale of country produce. Apart from farming, the backbone of Red Springs' prosperity is the lumber industry. Several fortunes have been made in the business, and many of the citizens are in some wise interested in the industry, but the chief enterprise is that of the Messrs. Williams, who have not only made a fortune for themselves, but have done much to promote the prosperity of the town. The chief manufacturing enterprise, after that of lumber, is a cotton-seed oil mill which was erected a year or two ago, and which has done fairly well for its stockholders. As, with every town in the county, the mainstay, after all, is the rich backing of agricultural lands. Accordingly, every word said on that subject in this paper is applicable to Red Springs Township. In fact, some of the biggest farmers in the whole county, and that means in the State, live here. Notably, Mr. A.T. McCallum, who is a member of the State Board of Agriculture, and who, in that capacity, has become widely known. Then there are Messrs. J.W. Graham, A.B. Pearsall, Martin McKinnon, who inaugurated the trucking industry at Red Springs and has an immense area in cantaloupes right now, and others. The people of Red Springs are active in advertising their town, and one means adopted this year is the inauguration of "Home-Comers' Week," when many of the exiles of old Robeson will probably take a peep at their old homes. Scores of Robesonians have gone away and fortunes elsewhere, and it will do them good and the couty for them to know that it is no longer necessary for the aspiring young men of the county to seek foreign climes in order to succeed. Cheap rates have been secured on all the railroads, and the date is set for the latter days of the August. Any reader interested in this matter should write to the Red Springs Citizen for particulars. Let every exile into whose hands this paper falls make ready to come. SOME OF RED SPRINGS' LEADING CITIZENS. Here follow brief sketches of a few of Red Springs' leading citizens. No endeavor has been made to make the list complete. It would take a book to mention all the men of Robeson worthy of note. Successor to the late McKay McKinnon with the New York Life Insurance Company. The many friends of the late jolly Col. McKay McKinnon are delighted that the great business for the New York Life Insurance Company built up by that prize-winner has fallen into the hands of a capable successor in the person of his son Arch., who is the youngest man with the rate book the company has in the State. Mr. Arch is the only man in the county offering New York policies, and he sells them. He insists that he is the only man in the county that sells absolutely incontestable insurance. His company says not a word even when the policy-holder commits suicide. Mr. McKinnon is twenty-three years old. As has been mentioned, his father was the late McKay McKinnon. His mother is still living. She was formerly Miss Grace Hawley. Mr. Arch. was educated at the excellent Oak Ridge Academy. He is a clever young man, and is already a successful insurance writer, having written something like $125,000 since January 1st. One of the leading Physicians of the County and a Genial and Scholarly Gentleman. Dr. McMillan was born near the site of Red Springs, but a that time the present thriving town was undreamed of. His father was John McMillan, and his mother, before her marriage, was Miss Mary E. Smith, whose father, the Reverend Daniel Smith, was a cultured Presbyterian minister, a sketch of whose life one may read in Dr. Howell's History of the Presbyterian Church in South Carolina. Dr. McMillan's great-grandfather Brown was one of the six delegates from this county to the Convention in Fayetteville that ratified the Constitution of the United States. It is clear the doctor is sprung from an ancestry of whom he may be proud, and a worthy son of worthy sires is he. He married Miss Lou A. Purcell, whose father was Malcolm Purcell, who once represented his county in the General Assembly, and had been licensed to practice law. He was a graduate of the University of North Carolina. Dr. McMillan secured his education at the University of North Carolina and at the University of Maryland, graduating in the medical course at the latter institution in the year 1882. 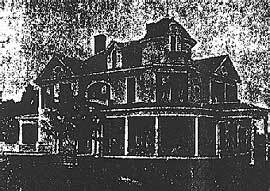 He began his practice at Plainview, near the site of Rowland, in 1883, and there toiled for sixteen years, removing to Red Springs in 1898 and forming a partnership with Dr. J.L. McMillan. 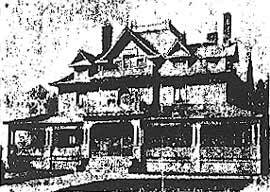 Dr. B.F. McMillan has a lovely residence in the very heart of the town of Red Springs, a cut of which is found elsewhere. Here is a model home in a model town. One of the most useful institutions in the town of Red Springs and one of the most devoted to the interest of the town is the Citizen, the weekly paper published by Mr. R.B. Branch, who is both a practical printer and a good newspaper man. The Citizen is a capital local paper. County Surveyor and Civil Engineer. Mr. Purcell is one of the county's busiest men. He has work enough now before him to last him for months and maybe years. He would like to employ a bright and energetic young man to help him. Mr. Purcell was old enough to be in the Confederate army, but one would not judge so from his appearance. He spent the session of 1861-62 at the University of North Carolina, but stopped to take a course in that cruel school of experience, serving in Company D, First Battalion, Heavy Artillery, unti the fall of Fort Fisher, after which time he served in the engineering corps and was at Kinston and Bennettsville in that capacity. He returned to the University in 1866 and graduated in 1868, the last year of the old regime. Returning home, he became a farmer, and has devoted himself to that profession and to surveying ever since. He was elected county surveyor last fall. Mr. Purcell has been living in Red Springs eight years. He was reared in Blue Springs township. He married Miss Cornelia McCallum, December 19, 1892, and they have five children. Mr. DeVane is a son of the late Col. DeVane. His wife is a sister of that gallant soldier, Col. Ashford, who was accidently killed a few years ago at Clinton by the explosion of a boiler. She is an aunt of Editor Oates, of Fayetteville. Mr. and Mrs. DeVane have possibly the prettiest home in Red Springs, a cut of which is here given. They have an interesting family of children, whom they are giving splendid opportunities for culture. Mr. DeVane is larely engaged in the lumber business and is also interested in farming. He is a member of the Baptist church and is one of the main supporters of the Red Springs church. Red Springs has a number of wholehearted citizens and clever business men, but none surpasses Mr. J.N. Hadley, our genial Friend. Mr. Hadley conducts a general mercantile business and is a man from whom goods are bought at right prices. He is as open as a book, and it would be difficult to imagine one mistrusting him. We unhesitatingly commend him and his store to the readers of this paper. A hustler is this gentleman. He is the leader in business circles in Red Springs. He has made melon growing a lucrative industry about this flourishing town. He has hundreds of acres in the luscious melon right now. As manager of the largest mercantile firm in that town he is a success. He is public-spirited and progressive, genial and yet urbane in manner. He has succeeded and deserved to succeed. His is one of the most beautiful homes in the county. This gentleman is not merely a leader in the social and business life of Red Springs, but is, without doubt, one of the best known and most highly appreciated citizens of the county. He has large farming interests and is one of the number of farmers in this county that make more than a hundred bales of cotton. He has an elegant home at Red Springs and an interesting family. His wife is a sister of Mr. C.B. Townsend, of Lumberton, and of the late Mrs. N.A. McLean, of the same town. Col. McCallum is a member of the Board of Agriculture of the State and as such has been very efficient. He is engaged personally in the fire insurance business and does the larger part of the business of that section. Red Springs can boast of few cleverer fellows than the subject of this sketch. He is a native of Richmond County and was reared on the farm, but began work in a store in Randolph County when only thirteen years of age. His educational advantages hav been limited to the common schools and the great shcool of business. He spent two years in a dry goods store in Charlotte before coming here eight years ago. His first year and a half at Red Springs was spent as a salesman. He then began merchandising on a small capital, which has grown with the years till Mr. Garrett now owns valuable property in his adopted home. He had as a partner for some time Mr. J. R. Poole, the prsent efficient superintendent of schools for the county. After Mr. Poole became superintendent , Mr. Garrett went into partnership with his father-in-law, Mr. Jas. A. McNeill. These gentlemen, under the firm name of Garrett & McNeill, conduct the most popular grocery in the town of Red Springs. They are doing an excellent business, and deserve their good fortune. Mr. Garrett showed his good sense by getting married three year ago, and was fortunate in securing the charming daughter of Mr. Jas. A. McNeill, a staunch citizen of this section. Drugs and Druggists' Sundries. Prescriptions a Specialty. Above is an interior view of the store of the Red Springs Drug Company. In only a short while this business will be established in much handsomer quarter. But even now, as indicated by the cut, Mr. Grantham, the proprietor, has reason to congratulate himself upon the appearance of his store. Mr. Grantham is a native of Johnston County. He is a young man of genial disposition and a pharmacist of ability. He was registered as a pharmacist in 1899, and has been at Red Springs for five years. Drs. B.F. and J.L. McMillan have their office in this store. This fact, with the further one that Mr. Grantham knows his business and keeps the purest drugs makes his store the natural place for ethe Red Springs people to get their goods in this line. The career of this gentleman is a perfect illustration of what we are undertaking to do in this publication—to show that this county presents opportunities for the energetic and thrifty. Mr. Singleton came to the county in November, 1889, and then had practically nothing. He is now worth thousands of dollars and has made it by his own efforts. He worked for a salary for four years and then conducted a small merchantile business till 1895, when he and Mr. R.L. McLeod entered into partnership and rented a small sawmill, each putting in $300. That very year they bought the mill, paying $1,300 cash. In January, 1899, Mr. Singleton bought Mr. McLeod's interest for $10,000, and on April 8, 1903, he bought the saw-mill plant of Mr. M.L. Marley, at Allenton, for which he paid $14,358. He is still in the mill business and his success is manifest. Mr. Singleton is building a palatial home at Red Springs, the designer's cut of which we present to our readers. He has an interesting family and is hospitable to a great degree. Accordingly, it is a matter of congratulation to the town of Red Springs to secure Mr. Singleton as a citizen. Here is a man that may well be classed among the leading farmers of the county, while so many who own five times as much land could not aspire to that prominence. He owns only seventy-five acres of land, but the success attained shows clearly the point that we would emphasize—that it takes very little Robeson county soil to make an energetic man independent. Just think that Mr. McKay is able to have three daughters in college and three other children in school, and to live in comparative affluence, and all this as the result of the cultivation of a seventy-five acre farm, far removed from a city and depending upon the staple products for his income. Last year he made 32 bales of cotton, four hundred bushels of corn, and all the supplies used on the farm except manufactured articles. Mr. McKay is 56 years of age and lives on the very place upon which he was born. His father was Duncan McKay and mother, who is still living, was before her marriage Miss Harriett McNeill. Mr. McKay is, accordingly a full-blooded Scotchman, and stands high among the clansmen of the "upper end," but is equally popular among those in this end of the county who are so fortunate as to know him. In the person of Mr. H.S. Toon the A.C.L. has a most excellent officer in charge of its agency at Red Springs. He is industrious, exact and courteous, and, furthermore, public-spirited. Mr. Toon is a son of no less a personage than the late General Toon, who died a few years ago while serving as State Superintendent of Education. Our subject is only 31 years old, but has been with the A.C.L. about fifteen years. This means, of course, that his education has been secured chiefly in the school of experience. He had the advantage, however, of a few terms under the efficient instruction of his father. He began the study of telegraphy at Fair Bluff, and his held various agencies. He has been at Red Springs two years, and is there held in the highest esteem. He married Miss Bessie Scarboro of Bishopsville, S.C. and they have three children. Elsewhere is presented a cut of the good home of these popular young people. This gentleman is a native of South Carolina, but has been in Red Springs sufficiently long to be fully at home. Indeed, he has done a good part in making that hustling town what it is. He runs a good hotel; was formerly a merchant. He is building several stores.